This peaceful park along the Mapocho River features several different types of sculpture, from representational to geometric and abstract, in natural materials such as stones, and also some of more distinctive pieces, such as a yellow cage-like structure, and a large metal cube made of parallel bars. 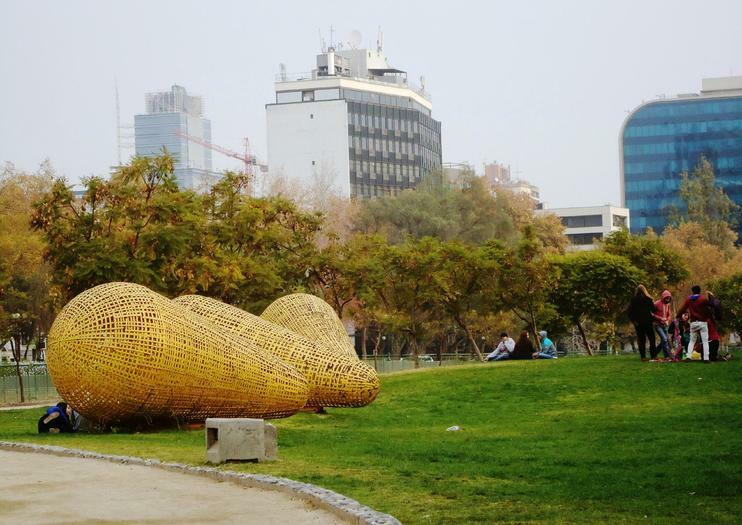 The sculpture park is easily found by exiting the metro at Pedro de Valdivia and heading north, and you will recognize immediately that you are headed in the right direction as you cross over the Mapocho river on a bridge that is also dotted with sculptures. Alternatively, on your way out of Cerro San Cristobal, take a taxi or walk down to the Pedro de Valdivia side and walk a few peaceful blocks through the tony Pedro de Valdivia Norte neighborhood before entering the park. The park is a quiet place for a picnic or to sit in the shade, and on clear days, there is a great view of the Andes to the east. A new administration building on the north side of the park can help you out if you have any questions, and just outside the park to the west is one of the city’s new Plazas Activas, a set of human powered, gym-like equipment if you want to get an outdoor workout in. The park generally closes at dusk, but in January, the Providencia (the neighborhood the park is in) Jazz Festival is held there for a few nights. Didn’t get a ticket? Do what many other neighbors do, and pull up a chair or blanket outside. The acoustics are fine on either side of the fence. See a different side to Santiago as you glide around the city’s parks and green spaces on a 3-hour bike tour. Hop on your mountain bike and follow your guide around the beautiful Bicentennial Park, take in the views from San Cristobal Hill and pedal around the Bellavista district. Keep your camera to hand as you stop at landmarks like Plaza Italia, Parque de las Esculturas and La Casa Chascona along the way. Be seduced by the city of Santiago on a half-day bike tour including a visit to Sky Costanera, South America’s tallest building. With your guide, you’ll explore Santiago’s principle parks and landmarks by bike and gain a holistic picture of the Chilean capital. Ride through the bohemian Bellavista district, Providencia and Vitacura neighborhoods. Then, conclude your tour by ascending to the summit of the colossal Sky Costanera Center to absorb panoramic city vistas.